By Steve Klein, PE, PH, Barr Engineering Co. The new municipal separate storm sewer system (MS4) permit issued in 2014 and changes to the Minnesota Pollution Control Agency’s stormwater pond guidance -- including the 2012 release of the document “Managing Stormwater Sediment Best Management Practice Guidance for Municipalities” -- require more extensive monitoring, maintenance, and modifications of stormwater ponds operated by cities, counties, watershed districts, and the Minnesota Department of Transportation. All such MS4s are required to annually inspect at least 20 percent of their system, conduct necessary maintenance, assess treatment effectiveness of their ponds, and make any modifications needed to improve water-quality treatment. Complying with these requirements can come with a high cost, especially if the ponds have never been maintained. When operating effectively, stormwater ponds collect and concentrate sediments and pollutants, improving the quality of stormwater runoff before it enters valuable water resources such as lakes, rivers, and trout streams. In many cases, these ponds work far less effectively than they could often due to accumulated sediment, which can be costly to manage -- especially if it is found to be heavily contaminated. However, a variety of other factors may exist that significantly limit a pond’s ability to optimally treat runoff. Fortunately, low-cost pond infrastructure modifications can often dramatically improve water-quality treatment. Current pond outlet that does not detain runoff from small, frequent storms long enough to achieve effective treatment, while enabling runoff from larger events to pass through more rapidly. Studies show that 90 percent or more of the mass volume of sediment and pollutants carried in runoff is transported by storms of a one-year event or smaller. The most common pollutant removal process for stormwater ponds is simple particle settling. If a pond’s outlet is designed to force water from small, frequent storms to stay in a basin for 12 to 24 hours, significant water-quality improvements may be achieved through settling with or without a permanent pool of water. Inlets with trash racks that have become plugged, causing the inlet pipe to clog with debris and sediment. This forces the flow to the pond via the inlet pipe to flow elsewhere, often bypassing the pond entirely. Inlets adjacent or in close proximity to outlets that cause water to leave the pond quickly with minimal water-quality treatment. 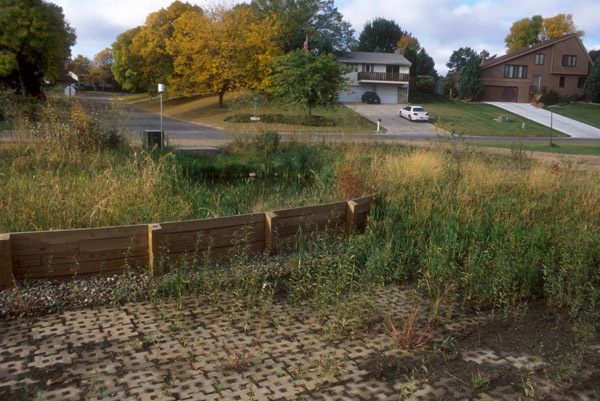 Flood detention basins with little or no water-quality treatment features or sediment storage. Outlets with no skimming features. Open-water ponds that function acceptably in warm weather but are covered with ice in cold weather and allow runoff to pass over the ice without significant treatment. No forebays, energy dissipaters, or flow spreader devices to slow and spread water entering the pond. Converting the pond’s outlet to include an extended detention feature such as a multi-tiered outlet structure that holds back and slowly releases water from a one-year or two-year event for a period of 12 to 24 hours, while allowing excess flows from larger storm events to leave the pond more rapidly (see photo 1, below). Such modifications can improve water-quality treatment for a pond that operates well in warm weather but minimally treats cold-weather and spring runoff. Typically, the modification minimally increases the 100-year flood bounce. In most retrofits Barr has designed, increases to the 100-year flood bounce ranged from 1 to 4 inches. Photo 1, above: An outlet modification in an Eagan, Minnesota, pond that detains flows from a two-year event for up to 24 hours. 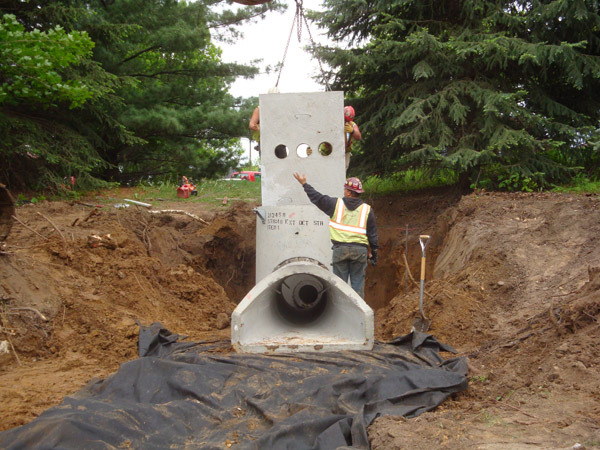 Installing flow diverters where a pond’s inlet and outlet are close to each other (see photo 2, below). The diverter forces runoff to flow farther into the pond and away from the outlet, allowing more time for sediment and pollutants to settle out in the pond. Photo 2, above: A flow diverter installed in a Woodbury, Minnesota, pond that prevents flows from moving too quickly into Tamarack Swamp, a rare, pristine wetland in the Twin Cities metropolitan area. Placing a permeable weir across the pond to slow and spread flows and prevent a narrow flow path so that the entire basin is used for water-quality treatment. Removing trash racks from pond inlets that serve no purpose. Excavating to create more volume for sediment storage. When considering long-term treatment and maintenance goals for stormwater ponds, keep in mind the many cost-effective best management practices that can dramatically improve water treatment and reduce maintenance costs. Steve Klein, PE, PH, is Vice President, Barr Engineering Co.